Multix Commercial Cling Wrap is ideal for Hotels, Restaurants, Cafes and Commercial Catering. It is strong, reliable and Cling Tight. It seals in freshness. Size: 600m x 45cm wide. 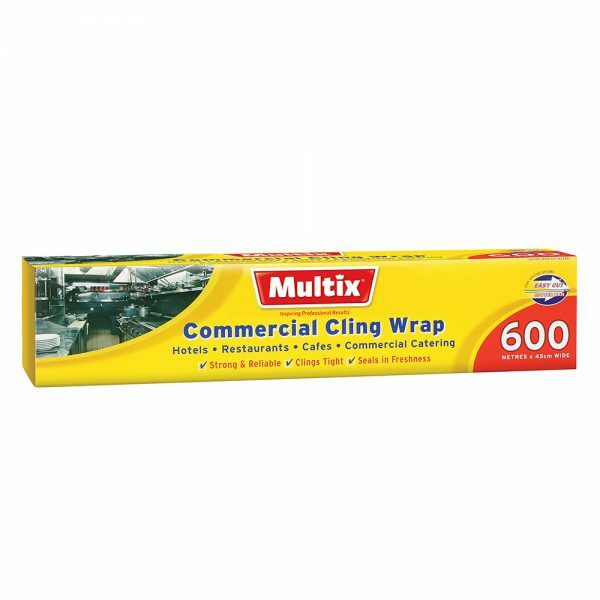 Multix Commercial Cling Wrap is designed specifically for the high volume users of cling wrap, such as sandwich shops, restaurants and cafes. Whatever your service is Multix Cling Wrap is the perfect solution to all you food storage needs. When microwaving, fold back Cling at one corner to allow steam to escape. Not suitable for use in browning units, combination or conventional ovens. This product is made from polyethylene with no PVC or plasticisers, BPA free. Do not remove serrated edge cover strip if planning to use Cutter Bar. Remove Cutter Bar from the core by opening one end of the box. Locate the position of the cutter bar on the box, remove the adhesive label and place Cutter Bar in position. Locate starter tab on the Cling, pull film out of the box and over the cutter bar. To cut Cling, slide the cutter it can be used in either direction.